Martin Courtney from the rambunctious punk act Titus Andronicus is working with a new group called Real Estate. 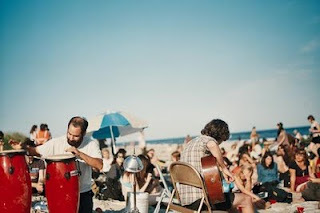 The song "Beach Comber" is a perfect end of the summer song. These Jersey boys are making some music that puts me at ease and has my mind wandering through memories of naps on the beach. They will be playing with The Japandroids at Rock and Roll Hotel in DC on Oct. 19 and at Glasslands in Brooklyn on Oct. 22. Come back for a review of the DC show.